Check out Tobi's Side Note Ribbed Crop Top Treat yourself with the Side Note Red Ribbed Crop Top. This evening crop top features a ribbed material, tight long sleeves, and a square neckline giving this crop top a structured feel. Pair this party top with high waisted denim jeans for a chic yet casual look. Treat yourself with the Side Note Black Ribbed Crop Top. This evening crop top features a ribbed material, tight long sleeves, and a square neckline giving this crop top a structured feel. Pair this party top with high waisted denim jeans for a chic yet casual look. Treat yourself with the Side Note White Ribbed Crop Top. This evening crop top features a ribbed material, tight long sleeves, and a square neckline giving this crop top a structured feel. Pair this party top with high waisted denim jeans for a chic yet casual look. 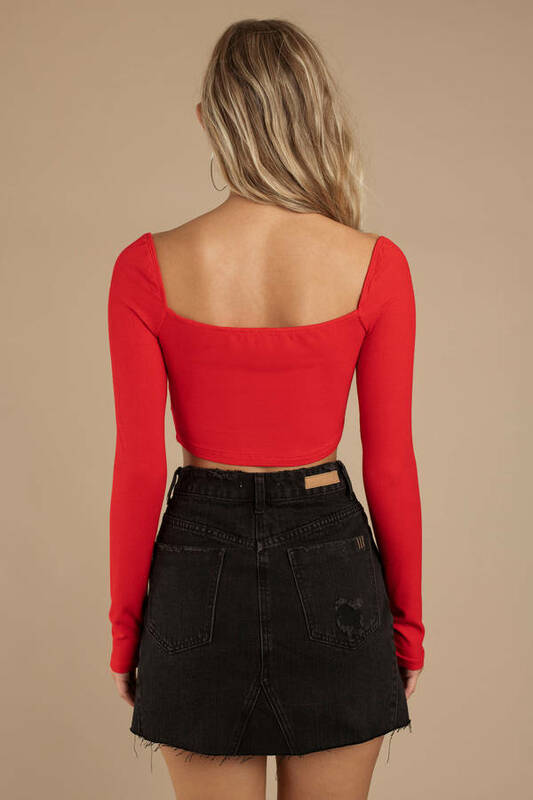 Treat yourself with the Side Note Red Ribbed Crop Top. This evening crop top features a ribbed material, tight long sleeves, and a square neckline giving this crop top a structured feel. Pair this party top with high waisted denim jeans for a chic yet casual look.